Mycosis Fungoides (MF) and Sezary Cell Leukemia (SCL) are related T-cell cutaneous lymphoma/leukemia. Mycosis Fungoides is an uncommon chronic T-cell lymphoma primarily affecting the skin and occasionally the internal organs. The disease is most common in middle-aged men. There are eczematous lesions, plaques, tumors and ulcers of the skin without overt blood involvement. In the late stages, the whole body may appear red. 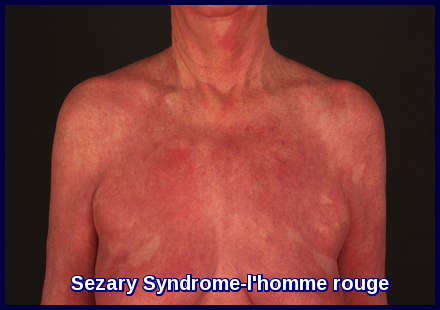 Lymphadenopathy is common and a leukemic element appears (Sezary Cell Leukemia); a diffuse pruritic skin rash and hepatosplenomegaly are then common. Systemic involvement of lymph nodes, liver, spleen, and lungs result in the advent of symptoms, which include fever, night sweats, and unintentional weight loss. 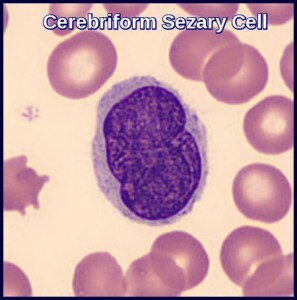 It must be noted that some cases originate as Sezary Cell Leukemia. In Sezary Cell Leukemia there is a lymphocytosis which may be over 200X109/L. These cells are typically large mononuclear cells with bizarre folded grooved nuclei with little cytoplasm. A moderate eosinophilia is common in both Mycosis Fungoides and Sezary Cell Leukemia. 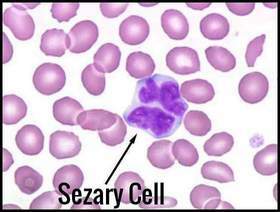 In Sezary Cell Leukemia there is a moderate marrow infiltration with the malignant lymphocytes relative to the blood count. 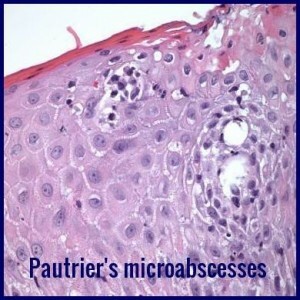 Skin biopsy in Mycosis Fungoides and Sezary Cell Leukemia shows infiltration of the dermis by the malignant cells with the formation of so-called Pautrier’s microabscesses. Histology may be equivocal early in the course because of insufficient quantities of lymphoma cells. The malignant cells are mature T cells (T4+, T11+, T12+). For staging, bone marrow biopsy and CT of chest, abdomen, and pelvis. PET scan may also be used for suspected visceral involvement. 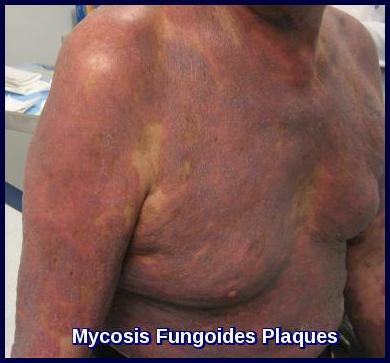 Mycosis Fungoides is treated with topical steroids, ultraviolet light and psoralens, electron beam radiation therapy or topical nitrogen mustard. Electron beam radiation therapy, in which most of the energy is absorbed in the first 5 to 10 mm of tissue, and topical nitrogen mustard have proved highly effective. Systemic treatment is primarily used when other therapies have failed, after relapse, or in patients with documented extranodal or extracutaneous disease. Systemic therapy is also given for Sezary Cell Leukemia. Various lymphoma-type regimens are used. Median survival in Mycosis Fungoides is 7 to 10 years after diagnosis. However, survival rates vary markedly depending on the stage at diagnosis. The prognosis is worse in Sezary Cell Leukemia. 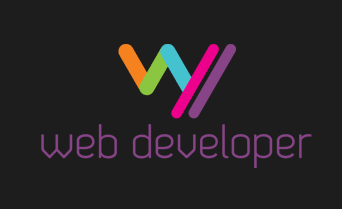 Willemze R, Jaffe ES, Burg G, et al. WHO-EORTC classification for cutaneous lymphomas. Blood. 2005 May 15. 105(10):3768-85. Vonderheid EC, Bernengo MG, Burg G, et al. Update on erythrodermic cutaneous T-cell lymphoma: report of the International Society for Cutaneous Lymphomas. J Am Acad Dermatol. 2002 Jan. 46(1):95-106. Olsen E, Vonderheid E, Pimpinelli N, et al. Revisions to the staging and classification of mycosis fungoides and Sezary syndrome: a proposal of the International Society for Cutaneous Lymphomas (ISCL) and the cutaneous lymphoma task force of the European Organization of Research and Treatment of Cancer (EORTC). Blood. 2007 Sep 15. 110(6):1713-22.